RAID5: This takes three hard drives in an array and reads/writes to all of them at once (called striping) so they’re super fast. It also writes error-correcting info so 2 of the drives are usable and the third is backing both up. If any dies, the data lives on. These are great for people who want to survive hard drive failures AND have zero downtime (enterprise people mostly). RAID6 is this but 2 drives can fail at the same time. RAIDZ1/RAIDZ2: These are like RAID5 but using fancier ZFS technologies that my cousin who’s a system administrator said is super badass a few years ago. RAID10: Striping and mirroring. This is 2 sets of mirrored drives (4 drives total) that gives you the performance of striping with the redundancy of mirroring. You et 50% of the space and need at least 4 drives. ZFS mirroring: Just reads/writes everything to two disks. Improved read performance, slower write performance. Also has lots of fancy ZFS features like auto-snapshots. You get 50% of the capacity. I decided to just do ZFS mirroring because I only wanted to buy 2 drives for now. If I upgrade later I can migrate the whole thing to RAID-Z1. I just really wanted to try out this ZFS business. For a CPU, I was surprised that my 2011 laptop CPU is still doing pretty well with a Passmark score of 6,619 and a power rating of 45 Watts. The speeds really have kind of slowed down in growth. 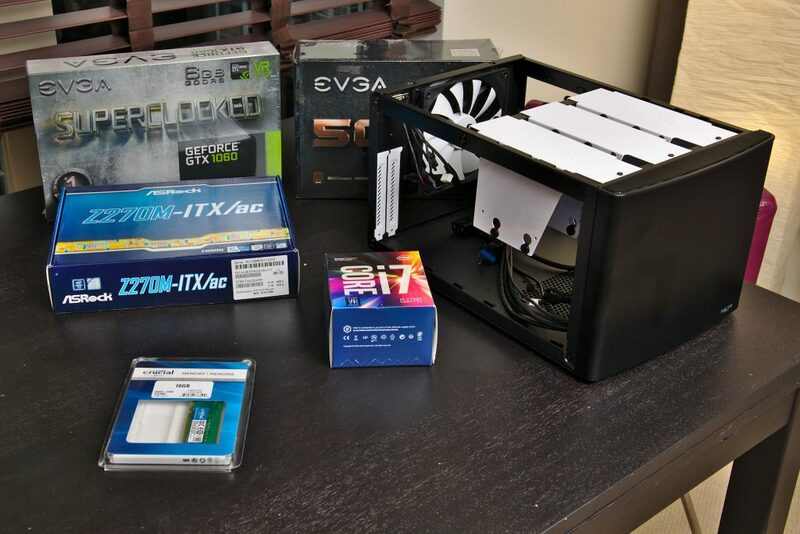 For size, I decided Mini-ITX form factor was right. 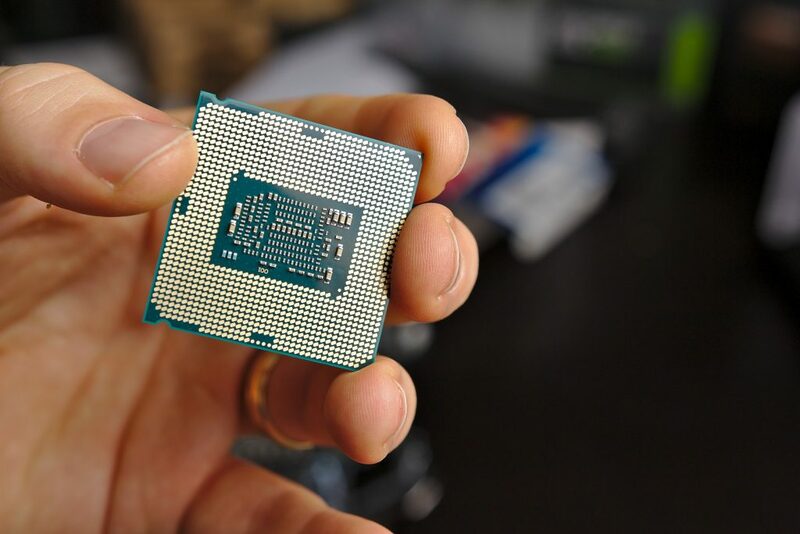 Most motherboards of this size that support ECC RAM are pretty pricey and take power-hungry Xeon processors. This guy got a $1000 board, which is badass but I was hoping to stay a price range below that or two. After a very long time of searching and weighing options, I decided that probability of non-ECC RAM errors is low and just went with regular RAM. I found a nice 25W processor that gets a 9400 Passmark (Intel 7700T). During this search, I found the wikipedia lists of i7 processors (and the i5, i3s too) very useful. It appears that for ECC RAM support you either need a slowish i3 or a super-expensive and powerful Xeon. 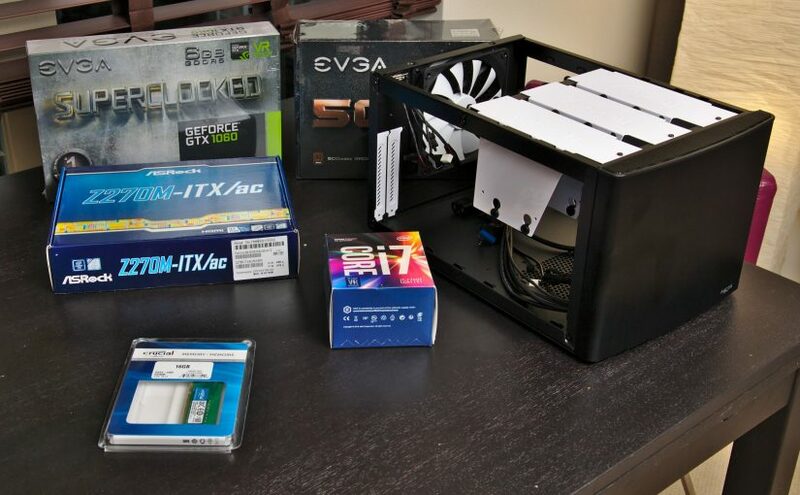 The i3-7100T is a solid low-power contender but I just couldn’t stomach buying something slower than my 2011 laptop because I wanted this thing to triple as a Blender renderfarm. 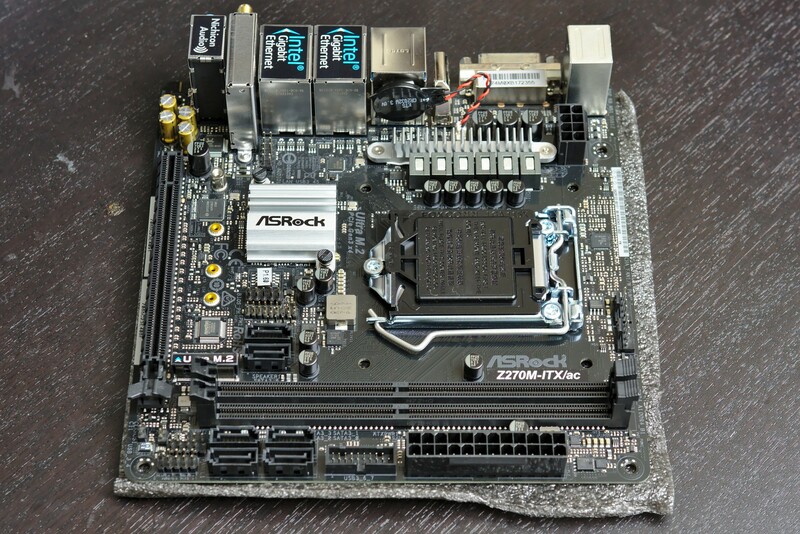 I found an epic board that had all the bells and whistles I wanted: the ASRock Z270M-ITX/ac. Not only does it have dual gigabit LAN but it also has wifi, so I can make a neighborhood upsidedown-ternet if I want, long a dream I’ve had. For cases, I found the Fractal design Node 304 which was nice in that it was small and had room for up to 6 hard drives. Nice! For hard drives, I went with two Red series Western Digital 8TB NAS drives. They’re spinning platters but are low-ish power and are spec’d out to last forever. I also discovered that there are now these things called M.2 ports on motherboards that you can plug little tiny SSD hard drives into for your operating system (last PC build I did was in 2002). So I grabbed a 500GB SSD for that. 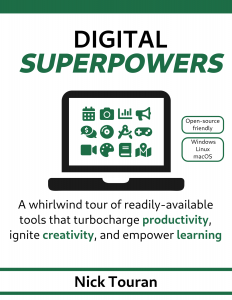 For Machine Learning, I knew I wanted a nVidia drive since they have CUDA and that seems to be used by most of the libraries I’ve looked at. I found a lot of nice webpages where people basically said that The nVidia 1070 with 6GB was fine for learning and up to medium-sized real problems, though for large practical problems it may struggle a bit. Since my goal is mostly to learn some ML I figured it was a perfect middle-of-the-road compromise. I was also wary of getting too much of a beast since I want this to be sort of a contradiction: cheap, low power, and powerful/future proof. Building was pretty easy. When I turned it on at first it didn’t bring up the screen. I had it plugged into a TV monitor through one of the motherboard HDMI port and tried switching it around. Eventually I discovered that it had to be in the nVidia GPU (bios gives it preference by default) and that the TV had to be plugged in when the PC booted. Up came the bios and I was a happy person. I knew I was going a bit overboard on power consumption when I got the GPU but I wasn’t sure how bad it would be. 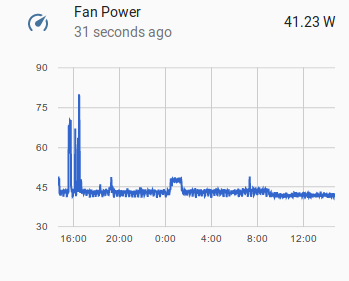 My two WD hard drives came a few days after I put the original parts together and I was happy to see a 25 Watt idle power consumption without them. When they came and I added them, I got a 40 Watt usage when this thing is under light load, peaking around 70 Watts. At 11 cents/kWh, that’ll cost $40/year to run continuously, compared to $5/year for my Raspberry Pi. Not too bad, but maybe I’ll let the Pi keep running the home automation system for now and turn the NAS on when needed. There are some great choices to make your NAS system easy to administer such as FreeNAS. Most people will enjoy using that. Personally, I’ve been avoiding pre-built applications like this because I like fiddling around a a lower level so I know how everything works. Of course, if you don’t like spending hours learning this crap, then don’t bother! I went with Ubuntu 17.04 which like most linuxes has ZFS and NAS and Samba and all the good stuff. I installed it via a USB drive and installed all my favorite programs, set up SSH, got the nVidia proprietary drivers, and we’re off. And then I started filling it up. I plugged my laptop into my Gig ethernet port with a hard-wire and copied over 500 GB of stuff. It was fast! Sweet! For Windows sharing, I’ll have to set up Samba eventually if my wife wants to join in on this fun. For now NFS is enough. I learned about ZFS snapshots and they blew my mind. It’s like version control for your hard drive. So if you delete everything, you can just roll back. It was at this point that I started wondering about permissions and user management. How can I control access among the PCs on my local network? As it turns out, NAS by default just does UID matching, so if user nick has UID 1004 on the server and user sketchy-friend comes by and hooks up to my wifi and sets his UID to 1004 as well, then NFS will serve him files as if he were I. This is fine for a home usually unless you have capable teenager hacker children. NFS4 supports Kerberos encryption so I’m going to have to figure that out too and see if I can get it working since it seems a bit more robust. Darktable (and many other programs) is easy, just ssh in with -XC or -Y to forward X graphics and run it from the command line. It pops up on the client PC and works great. X11 glXChooseVisual() failed, verify working openGL system! SSH in to the machine. Once I logged in, it went black again. I checked the ps aux again and realized that there was a new Xorg session under my main user account. I VNC’d into that one on ip:1 instead of ip:0 (after allowing access in the GNOME “Sharing” settings) and I was in! I probably could have started another x11vnc server after comandeering the Xorg authority file for that session as well. Note that none of this is secure and VNC sends everything over the LAN unencrypted so if any nefarious characters are on your Wifi you should not use this (at least without using SSH tunneling of the VNC stuff). 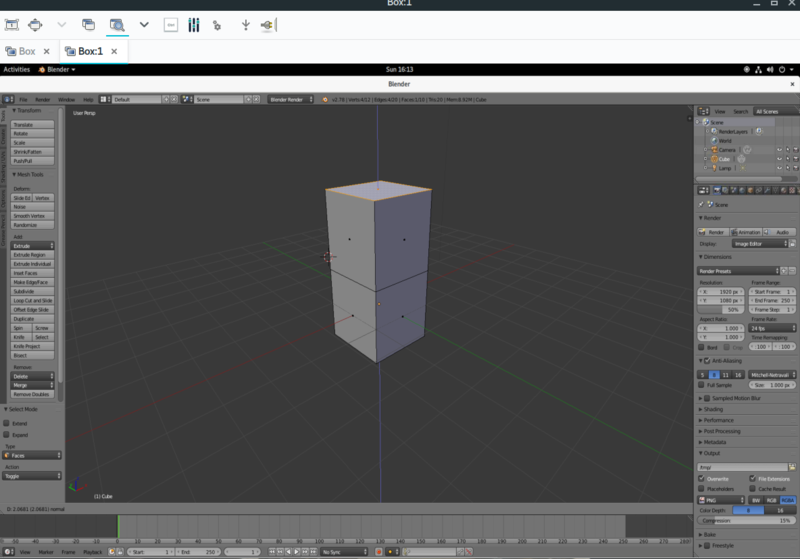 On second thought, if I just wanted to run blender, I could configure the vnc server to start a gnome-session (or something more lightweight) on a Xorg instance when it starts up. The only disadvantage of that is that it won’t control the actual TV for media server use. Anyway none of this is ideal yet but I’m making progress. If you know of better or cleaner ways, please let me know!! There’s a lot to do still, including setting up the Machine Learning libraries, getting Samba going, configuring Kodi for the media server, tweaking power settings, etc. I’ll keep in touch if anything neat happens. Hello from a follower of your blog. Whilst what you post was fascinating, well it does not matter what great hardware you build. Unless it is running either a QNAP or Synology OS you will always be in the /dark ages/. I went thru the loop of hand building my own NAS, but years later revert to QNAP or Synology. So much function from such mediocre hardware. But totally marvellous. I bought a synology 1815 three years ago after having built many NAS myself. It died after 2.5 years, requiring total replacement. Also, synology didn’t support NFSv4 (kerberos). 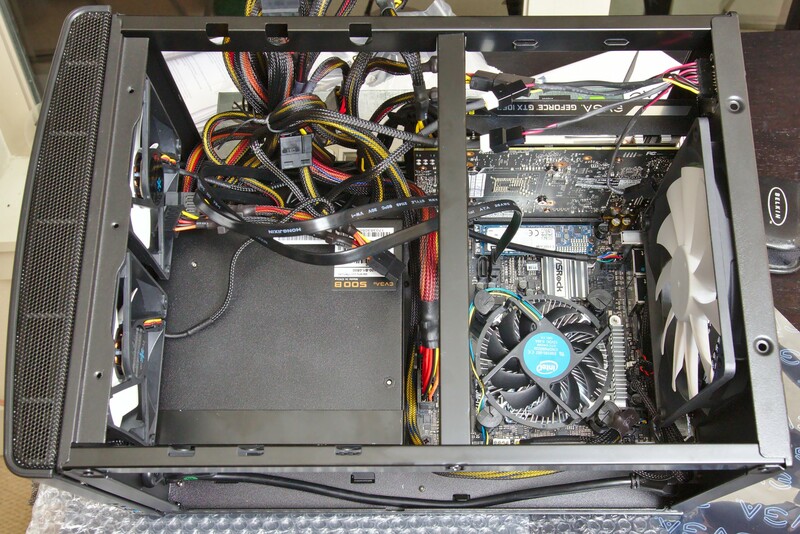 You cannot gradually replace parts and build new servers from (partially) old parts. To recover data without having a replacement is harder than when using plain vanilla freenas/freebsd or linux. My QNAP (also an 8-drive one) didn’t support NFSv4 either, so it has been downgraded to being an iSCSI storage for my real server (connected via 10gbit). I will never buy such a NAS anymore, but either build myself again, or just buy a cheap dell server (e.g. a T330 with 8 drives). Yes the hardware of the (home and SOHO-targeted) NAS is ok, but the software makes them unbearable IMHO. 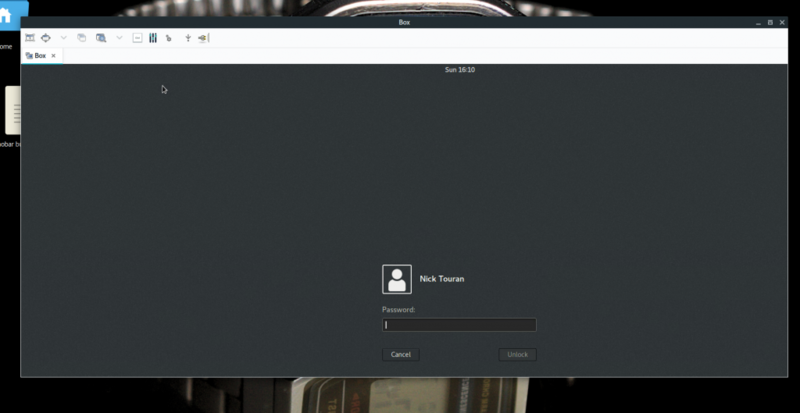 Currently I’m just running linux on my server and also on an intel NUC with 4 external drives connected through 40gbit Thunderbolt-3 enclosure, with ZFS raidz. Great article! This year I built my own NAS box for ZFS’ ability to repair bit rot, which was running on FREENAS. I also use FREENAS to host virtual machines, which run my docker containers.